When sixteen-year-old Colt McAllister’s parents are killed in a car crash, he learns it was no accident — his mother, a journalist, was writing an expose of the powerful biotech corporation Trident Industries. Now, Colt has been targeted, and he and his friends Oz and Danielle find themselves battling the same sinister forces that took his parents’ lives. A gateway between worlds has been opened, and Earth is in mortal danger. 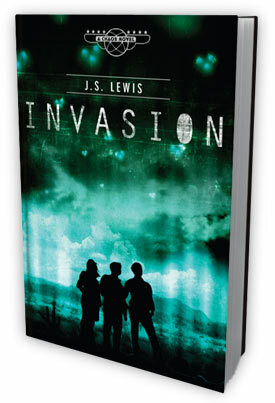 Thomas Nelson says Invasion has “crackling plot twists, cliffhanger chapter endings, cyber attacks, alien invaders, and an undercurrent of teen romance.” As a sci-fi fan and writer, sounds good to me! New York Times best-selling author Emma Walton Hamilton has launches the children’s writers’ salon Children’s Book Hub, a membership-based forum to provide information, resources and support for aspiring and established children’s book authors. There is a fee, $19.95, and members will reportedly have access to regular teleseminars with authors, editors, agents and other members of the children’s book industry. The site also will offer monthly newsletters, a members’ forum and lists of publishers that accept unsolicited manuscripts, among others. The industry has lots of other places to get info and support, but another can’t hurt. and 4th Runner Up: The Little Green Bubbles by Kevin Malone, illustrated by Lee Hadziyianis. Got any news to share? Next: Next post: Need a good book to read?